Anne appeared on Show 235, recorded in May 2011, at age 14. 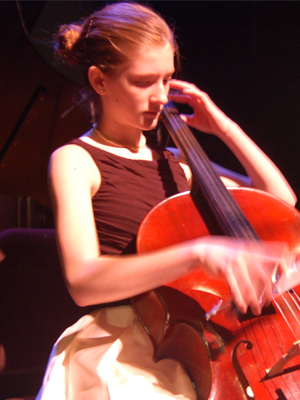 Anne Richardson (cello), age 14, is from Louisville, Kentucky and has been playing the cello for eight years. She is an eighth grader at Louisville Collegiate School and studies the cello with Eric Kim and Louise Harris. Anne is the principal cellist of The Louisville Youth Orchestra Symphony, and has won numerous awards including first place in the University of Tennessee Cello Competition, the String International Music Festival Concerto Competition, and the Kentucky ASTA Solo Competition. Anne also enjoys ballet, which she takes three times a week. From the Top Premieres on Classical South Florida!